Optiwhite™ by Pilkington is a new and unprecedented option for all your glass applications. 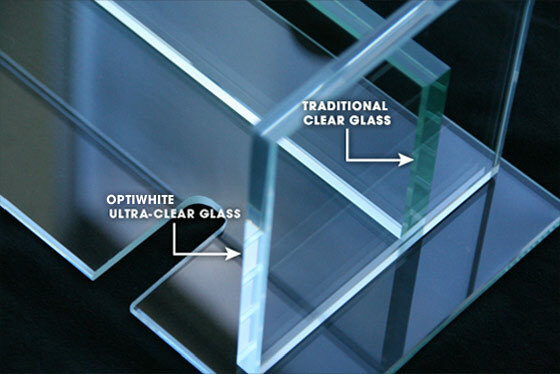 Optiwhite™ glass allows maximize light transmission and brings an uncommon brightness and clarity to any interior. Useful for entire building facades or retail showroom windows. No commercially available glazing product comes close to the pristine personality of Optiwhite™ glass. For all glazing in which enhanced energy performance is required, Optiwhite™ glass can be combined with solar control Low-E coatings to satisfy energy requirements while maintaining the unique ultra-clear visual character of Optiwhite™ glass. All Optiwhite™ glass is trademarked by Pilkington. *NEW - Verrage now offers Digital Printing directly onto glass! For best results, use clear Optiwhite™ glass for optimum color accuracy.